Comments: Deciduous conifer native to the Southern states of the US. 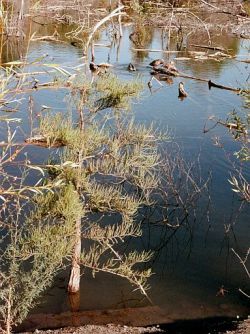 Similar to the Bald cypress in growing habit, but the Pond cypress has small vertical branchlets which hold the small scale-like leaves--both leaves and branchlets fall off in winter. Adult height of tree to 70' (shorter than the Bald Cypress). Also has the scientific name of Taxodium distichum var. imbricatum.